This “new world,” explored in McDonough and Braungart’s novel, Cradle to Cradle– Remaking the Way We Make Things, almost sounds like a fairytale. And yet, the vision they pose is no longer a dream, because through necessity it must become a reality. 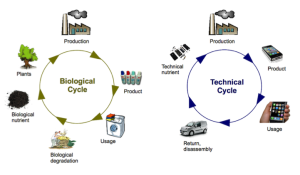 We see and understand this need for a circular– one in which resources can be utilized effectively and responsibly, and where used products can be directly put back into the technological material stream to be refurbished and reused, or back into the biosphere to biodegrade. We know the general concepts and routes that need to be taken but, the question is, why haven’t we done this yet? How do we finally ignite this change into action? You may be asking, why exactly do we need an entire shift of our economic framework? Sure, we generate a lot of waste, but can’t we just recycle and compost more, and be done with it? That’s what being sustainable means, right? Wrong. It’s time to stop trying to make our ineffective linear economy less bad, and to start doing more good. As Greyson clearly points out during the video panel, this is not simply a waste management question. 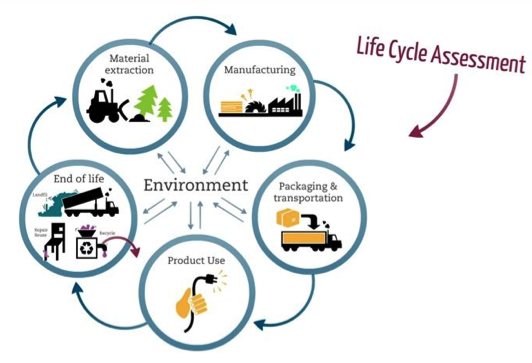 The current issues that come along with our linear economy today span much further than the landfill, and issues must be addressed from every stage in a material lifetime, not just at the end of its use. Poor design is indeed one of these problems– from using unsafe and unnecessary resources in product design, to designing products that, during use, will consume much more energy than needed. 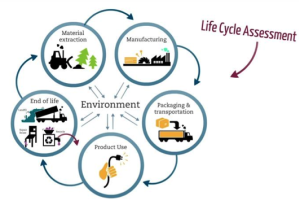 The fact is that most products are designed with a “cradle-to-grave” lifetime in mind– products that will be consumed, used until tarnished or broken, and then thrown away so that the consumer will have to buy more. Products are created for universal solutions, rather than local contexts, as McDonough and Braungart have explained. An example is the chemicals in laundry detergent. Less could just as effective certain areas, but a large amount is always used so that the product can performs the same everywhere, every time. This leads to another issue of the current linear economy: industrial growth. Producing and more seems to be the only goal of many industrial businesses. But, if businesses are able to use less resources, produce less products (of higher quality), there can still be economic growth–just not in the current “faster, cheaper, more” mindset. So how do we stop this endless flow of materials into landfills? It’s time to close the loop of material flows. The general concept behind a circular economy is that it is restorative. Material flows consist of two types, biological nutrients, which are prepared to reenter ecosystems safely, and technical nutrients, which are designed to circulate at high quality without entering the biosphere. The main pillars therefore are to eliminate waste through design, while also using as little (but renewable) energy as possible, to minimize usage of toxic chemicals, and finally to create a consumer shift to buying higher quality, longer-lasting products and moving toward a service economy. The process is clear in the image above. First waste should be minimized at all levels through life cycle analysis, and this doesn’t just mean recycling waste. Because what you may not know is that most recycling practices simply downgrade the material, and only extend its lifetime by maybe two generations. To truly be sustainable, as Leyla Acaroglu delineates in her TED Talk, Paper beats Plastic?, the shift to sustainability must come from all levels of production–from resource extraction, to design and processing, distribution, consumption, use, and then, of course, waste. 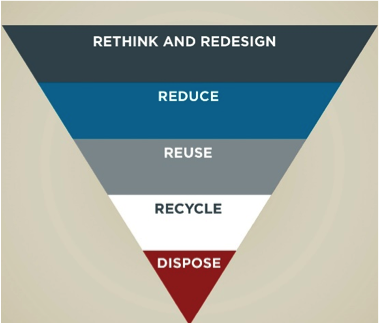 This redefines the waste hierarchy, and (such with as with precycling) the concepts of reducing and reusing are emphasized over traditional recycling, by using design and sustainable consumption practices to eliminate waste before even reaching the later stages of a product’s life. Therefore, waste must be eliminated at the extraction and production level through more efficient industrial techniques, as well as by using designs that allow for products to either last much longer or that allow them to be easily dissembled and refurbished without diminishing the value of the parts or the material. These technological nutrients can then be cycled right into making products again, instead of breaking down the material first and then recreating other products with lower quality substances. There is also a very large resource market of waste that could be degraded into biological nutrients. In the U.S. alone, 40% of fresh food is wasted. That costs about $165 billion dollars each year. Only a small percentage of this waste is composted, leading to methane being released in landfills during anaerobic digestion, which in turn is a leading cause of global warming. Cascading systems, expounded especially by Gunter Pauli in his vision for the Blue Economy, can therefore be set up where the byproduct of one process becomes the resource for another. Coffee grounds can decompose in compost, which then feed plants and animals, that can then generate manure which lead bacteria to create a biogas production of energy and so on. The key here is to create a systemic change in a systemic way; there’s no single policy that will work for every industry, and there’s no single route to creating a circular economy. There has been much progress from big businesses already, what with the Ellen MacArthur Foundation creating a forum (CE 100) for businesses to push toward this change. For example, the company Ecovative Design has created a completely biodegradable packaging product using mushrooms that can reenter the biosphere completely and safely after use. In another case, Acaroglu plans to design an electric kettle that is only big enough for one cup of tea. This eliminates the U.K.’s unique problem with high electric waste from boiling too much water in plug-in kettles. Designing longer lasting products is also an option. Designs should allow for items to be easily dismantled and refurbished, without downgrading the material. Nature can also be used as a template for design, with the technique of biomimicry; for example, the pattern of a leaf can be studied to create solar cell models. Each business must therefore rework their structure in a way that is beneficial to them. Will businesses decide to create higher-quality products with transparent information about material safety in order to boost sales through increased brand status? Or will they shift their product line into more of a service structure? This was indeed the case for the company Mud Jeans in Amsterdam which leases jeans for a year to customers, and then constantly recycles the material into more modern designs, using significantly less raw materials than other clothing manufacturers. Will big businesses partner with each other to create a complex of “industrial symbiosis,” where the waste from one production stream can become a resource in the next, clustering these cascading companies side by side? The options for success in a circular economy are paramount once we shift the meaning of success from faster and greater to better. With any substantial economic change comes shifts in policy. We can all attest that one of the main complaints about government today (at least in the U.S.) is the constant tax increases. A circular economy emphasizes that taxes should not be placed on those employed, but rather on the resources and energy used. 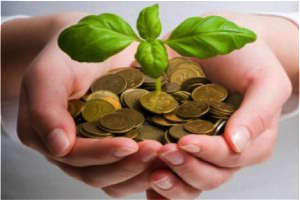 These ecological taxes will be an immediate market incentive for businesses to cut down mass inefficient production by wasting less in the production process and also encouraging the use of renewable energy. This could also generate a fallback on human labor and services, which therefore creates more jobs, circulating more money through the economy with less wasted resources. It is a well-known fact that businesses are in general weary of regulation and taxation. However, Greyson relays that government should see its role as setting up the system necessary for the framework of a circular economy by creating these market incentives. There does not have to be a clash between business and government; bottom-up innovation will happen as the result of people’s natural desire toward creativity and profit. According to Brennan, policy shift needs to allow for self-correction and response; change can’t happen perfectly over night. There have been policy changes though, especially with the Circular Economy Package just released by the European Commission. It aims to increase the recycling and reuse of municipal waste and institute a landfilling maximum of 25% by 2030. The package also calls for member states to create their own specific policy changes, specific to context and locale. 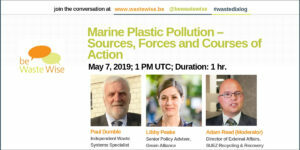 However, as moderator of the panel Maxine Perella claims, “It’s a great package if you want to squeeze the best out of the current linear economy.” The package is of course a step in the right direction– recycling is a process people are familiar with and generally accept. 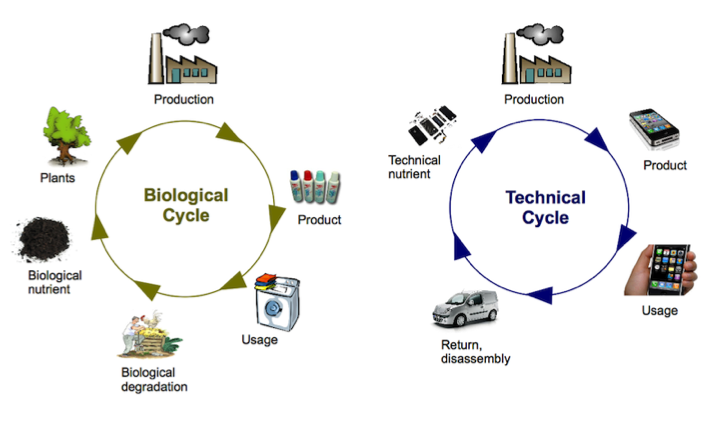 Still, circular economy requires systematic change. 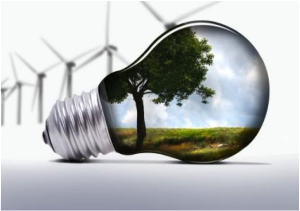 Sustainable consumption has thus become a prominent staple of circular economy. But people don’t always want long-lasting items. Tim Cooper (Professor of Sustainable Design and Consumption) has studied this, and after many surveys, he concluded that the desire for increased life-times on products is in general fairly split. There is a positive psychological aspect that comes from buying new items, and upgrading what you already have around you. Even when consumers do buy something they do want to last for a long time, few take proper care of their possessions. Manzini and Cooper realize a need of sentimental attachment between product and owner in order to encourage effective attention so as to last longer. Again, this is in direct conflict with the superfast tempo of the throwaway world. The circular economy thus calls for the creation of “islands of slowness,” where people take time to utilize information to buy higher-quality products and then care for them. Even though all this can’t be changed right away, consumers can still start taking steps toward sustainable consumption by participating in the sharing economy, by promoting quality brands through buying longer-lasting durable goods for long-term uses (such as household appliances), and then by purchasing easily refurbished or regenerated short-term products (such as clothing). As time goes on, consumers will begin to connect their intentions as citizens of the world with their actions as consumers. The ideas have been around for over half a century. Everyone’s waiting for everyone else to take the big leap, but if we really want to ignite this circular economy into action, we need systemic change on all fronts, and we need it now. The Third Industrial Revolution is upon us, and it’s one that brings waste in as resources, and nature in as a template and a teacher. No longer will resources be unearthed from the ground just to be warped, ravaged, and thrown back. No longer will we use harmful chemicals and generate polluting emissions into our air and our Earth. The circular economy can begin today, if only we make a move for it.